Plus, something new, there is lutein, beta-carotene and antioxidants c and e which are good for the skin (“when consumed daily for 2 weeks” as the box says). However, let the review of the flavors commence. 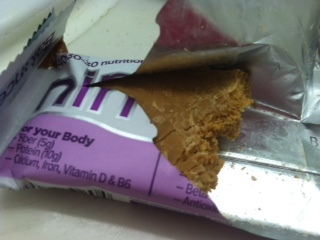 The bar itself was very soft, and chewy, and also quite dense. The flavor was ok, not super peanut buttery, but I can tell its “peanut butter flavored”. It was sweet but not too sweet, but NOT sugary tasting. It also had that salty flavor, and a little bit of an aftertaste. I noticed that both bars had tiny little orange dots in them. If you look closely at the pic, you can see it! Overall, pretty good. Have water nearby as they made me crave a cup of it! They are kinda tiny which is something to note, but I like the nutritional facts, the ingredients, and the flavor is quite good. AND only 4 grams of sugar! Woo! Two thumbs up! 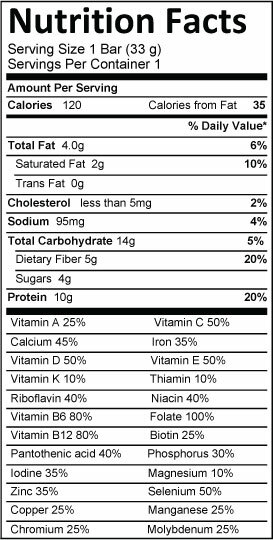 Nutritional Information for the Peanut Butter flavor (SOURCE). 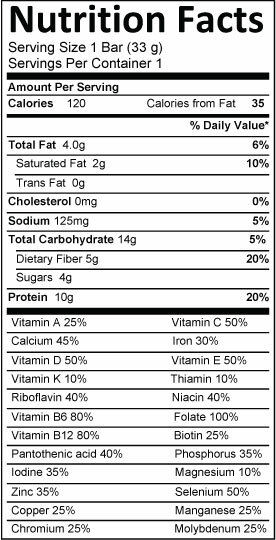 Nutritional Information for the Yogurt Orange Swirl flavor (SOURCE).